If you’re familiar with my blog, you already know I was raised Protestant, lost my faith in my late teens, and became a self-professed atheist by my mid-twenties. You'd know that as an avid reader, I continued to explore the subject of God via the philosophical works of nearly everyone I could get my hands on. You’d likewise know that by my mid-thirties, I’d abandoned my atheism, concluding that faith in God, comparatively speaking, is far more rational than either no faith at all or faith to the contrary. What you may not know is that, years later, after a series of extraordinary events (some tragic, a few miraculous), I decided to quit merely admiring the principles and virtues espoused by the great thinkers, leaders, saints, and writers of the ages and instead live such values as fully and as sincerely as I could. I continue to fall short, of course. I’m a sinner, after all, as this post will no doubt confirm. I recently mentioned my discovery of Bishop Barron's wonderful Youtube videos about Christianity and the Catholic faith, and, eager to learn more about Catholicism in particular, I attended a Catholic service and later bought a few books on the subject. I have no Catholic friends, so in order to further prep for the R.C.I.A. (Rite of Christian Initiation of Adults), a class provided to those who wish to learn Catholic doctrine, I read from various Catholic sites and gleaned what I could from a local affiliate of a Catholic radio station. 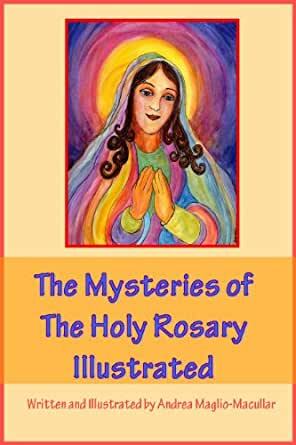 In addition to buying a couple copies of The Catechism, (more to follow about those tomes in the coming months), I also bought a couple of rosaries and two e-booklets which focus on the rosary prayers and the mysteries. Now that we’re up to speed, let’s briefly review the awful booklet first. The Mysteries of the Holy Rosary Illustrated by Andrea Maglio-Macullar is an embarrassment to the faith. It’s composed by a watercolor painter slash writer slash rosary maker whose ignorance of basic English composition and painting wasn’t going to dissuade her from producing an illustrated booklet. I don’t mean to be a jerk here, but raised within a religious environment, I saw plenty of ingénues and dilettantes who wanted to share the Gospel despite their lack of talent. Think American Idol and those whose embarrassing auditions ended up on the reject reel. Lest you brand me a curmudgeon, let me be clear. I salute those who wish to spread the good news. It requires courage, self-sacrifice. My only suggestion is that if you want to sing for the ministry, make sure you’re not tone deaf. Granted, your performance might break a listener’s heart and move him to convert, and that’s admittedly the essential purpose of the ministry. And yet, for what it’s worth, I’d respect you more if your ministry relates to your skill set and isn’t merely an excuse to force more mediocrity on the world, regardless your religious zeal. Although Maglio-Macullar’s primary job was to reprint the traditional prayers found in a host of sources and a number of devotionals, she still managed to both omit and misspell words, as well as misplace punctuation, throughout. The illustrations, courtesy of the author, are of the caliber you’d find fashioned by children in day care centers in poorly lit … sorry. I’m trying to be a better person. Let’s move on to the good one. 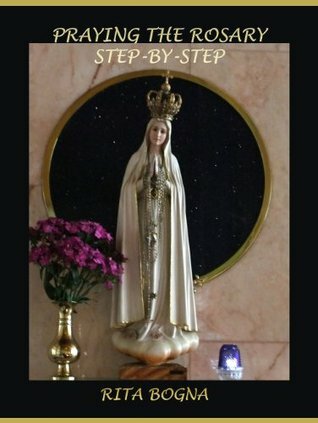 Praying the Rosary Step-by-Step, by Rita Anna Bogna (with beautiful illustrations reproduced from the 1866 black and white woodcut engravings of Gustave Doré), is so much better in both quality and content that Maglio-Macullar’s e-booklet appears as a spoof in contrast. (Told you I was a sinner.) Anyway, this one is well worth the mere four bucks it cost. Well resourced, too, and thorough, with an Introduction about the history of the rosary, its associative prayers, as well as links to additional sources. Highly recommended. Five out of five stars. It took me a week to complete this booklet because I went over it, you guessed it, step by step. As with the first booklet, each chapter is devoted to a set of five specific mysteries in keeping with Catholic tradition. By that I mean the booklet lays out the official prayers and practices – on which bead one recites this or that prayer, in which order – as well as the origins of a given prayer, and so on. Exceptions aside, daily mysteries are fairly straight forward. Mondays, Saturdays, and Sundays (after Epiphany but before Lent) celebrate the Joyful Mysteries – five events in the New Testament dealing with our savior Jesus Christ and our Blessed Virgin Mary. Tuesdays, Fridays, and Sundays (during Lent) are devoted to another set of five mysteries, known as the Sorrowful Mysteries. Wednesdays, Saturdays, and Sundays (from Easter to Advent) the Glorious, Thursdays, the Luminous. The mysteries, staggered throughout, act as an interlude of remembrance, snapshots in the life of Christ, mini daily sermons of what Jesus promised, performed, and endured. They’re intended to invoke wonder and gratitude. We’re reminded of Christ’s ministry, His love for us, His charity, His sacrifices on our behalf. And we meditate upon these gifts. It’s truly edifying. These mysteries are sources of inspiration for personal prayers and thanksgiving as well. In this state, whether kneeling or sitting, I’ve found myself pausing in my progression with my fingers along the beads, straying from the script, if you will, and praying whatever enters my head. It’s the ideal state of mind, as well as disposition, for communion with God. The revelation, for me anyway, was what effect praying the rosary would have on me. I’ve discovered a number of things not only about prayer in general that I, as a languishing Protestant, misunderstood, but about my relationship with God as well. For example, as a Protestant, I used to pray much like a teen might address a parent, generally only when that teen either needed something, wanted something, or felt grateful and wanted to say thanks. This isn’t to say I prayed only when life proved difficult or when in a grateful mood. Still, the summary is fair. Periodically I’d recall God’s grace, sporadically thank Him for His blessings, intermittently ask for help, and so on. This made for shoddy devotion. Days would elapse in which the exercise of prayer wouldn’t even occur to me. In addition, these prayers rarely lasted for more than two or three minutes. Granted, we’re taught that God is less concerned with the length of our prayers and more concerned with our sincerity. Still, in retrospect, I can’t help but note that my prayers as a Protestant tended to be often brief, sometimes contractual in tone, and influenced by mood – grateful when predisposed, earnest when in need, flippant when distracted. With the rosary, though, I find that not only do I pray more – nearly every day and certainly for longer periods – but that I pray more deliberately and more sincerely. While it’s true much of the rosary, particularly the decades (pronounced DEH-kids), might strike many as redundant, repetitious, archaic, perhaps cultish, I don’t find these canticles or chants the least bit off putting. On the contrary, going over these beads unhurriedly, meditatively, draws me deeper into the exercise of prayer. Truly, I can’t help but notice its parallel with everything we do in life. Regardless the exercise – whether cooking from a recipe, practicing or performing on a musical instrument, even the culturally accepted practices of social interaction – all of it follows patterns that, after years of doing, we do unthinkingly and ultimately take for granted. Take musicianship as one example. The parallels are staggering. For me, each session on the guitar would begin with finger exercises, warmups, drills, occasionally accompanied by a technical booklet filled with musical notation. Then, after a few minutes had elapsed, I’d fall into the groove. I was making music. Again, same with writing today. I sit down and face the computer monitor sometimes with no idea what I want to say. I often begin by typing random words and sentence fragments, prepositional phrases, verse. Just going through the motions, one might say. Then sentences begin to form. Ideas connect. Eventually fingers fly and I’m telling a story or reviewing a book. Yet again, the same holds true for praying with the rosary. Reciting the conventional Our Father, Glory Be, Fatima, and other prayers draws me into a state of quietude and calm. A sublime beauty accompanies this process. Uttering words of invocation. Hail Mary, full of grace. The Lord is with thee. By the time I’ve reached the first decade, the beads are entwined round my fingers. My breathing is slow and rhythmic. I’m focused. Everything falls into place. Soon I’m praying independently of the rosary. Dear God. In my own words. I remember after only a few days thinking, “It took praying this way to see, but I get it now!” Dare I say it’s all connected? One could liken the repetition of the Hail Mary to that of a child’s grateful cries of “Thank you, thank you!” or its innocent pleadings “Please, please!” to its parent. The fretboard, the computer keyboard, the rosary – all instruments, devices, that serve a process or facilitate an exercise, whether it's a song, a story, or communion with God. Eventually this template, this mechanism, recedes into the background and the process itself, the steps, becomes the dance. Progressing along the beads, my daily cares evaporate, after which I generally feel spiritually restored, refreshed, as if my soul has been nourished. I’m not kidding. Nor am I trying to convince or convert anyone here. I merely want to document my experience candidly, before too much time elapses and these impressions become too faint to chronicle. In short, I want to share what I expect will eventually lead to my confirmation and practice of the Catholic faith. So far, I’m enjoying the journey and look forward to the destination, namely enrolling in the R.C.I.A., becoming part of the Catholic Church, and ultimately drawing closer to God.